This post originally appeared as a review on Project Latte, my soon-to-be defunct cafe culture site. 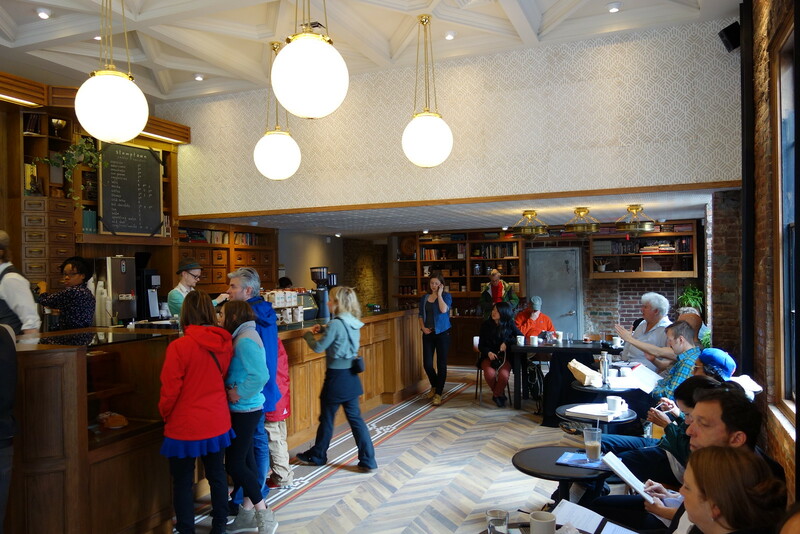 Located just north of Washington Square Park, the beautiful Stumptown Coffee Roasters flagship outpost has something to offer coffee drinkers of all levels. Part-cafe, part-coffee lab, the West 8th Street location is designed for efficiency in getting busy Manhattanites in and out quickly. The larger, front cafe area sports two custom La Marzocco Stradas and has wifi and a fair amount of seating. 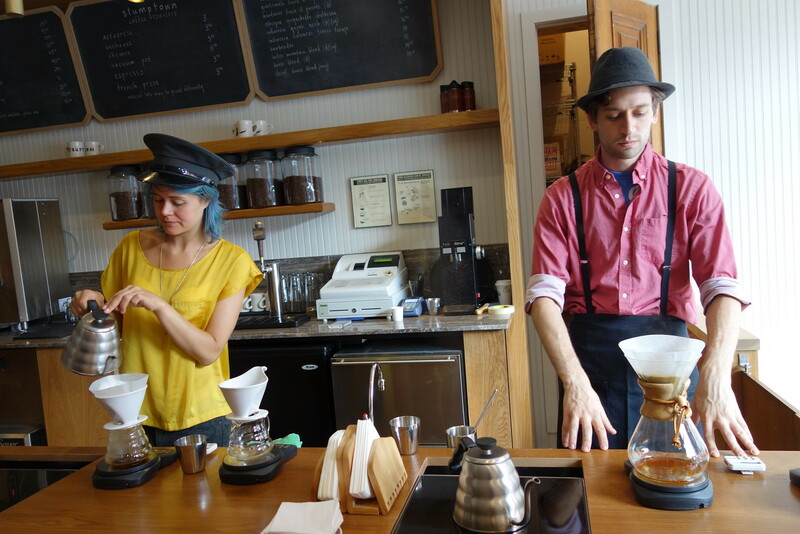 Located in a separate room behind the cafe is the standing-room-only Brew Bar. Customers looking for a more educational and coffee-centric experience should head directly to the back. 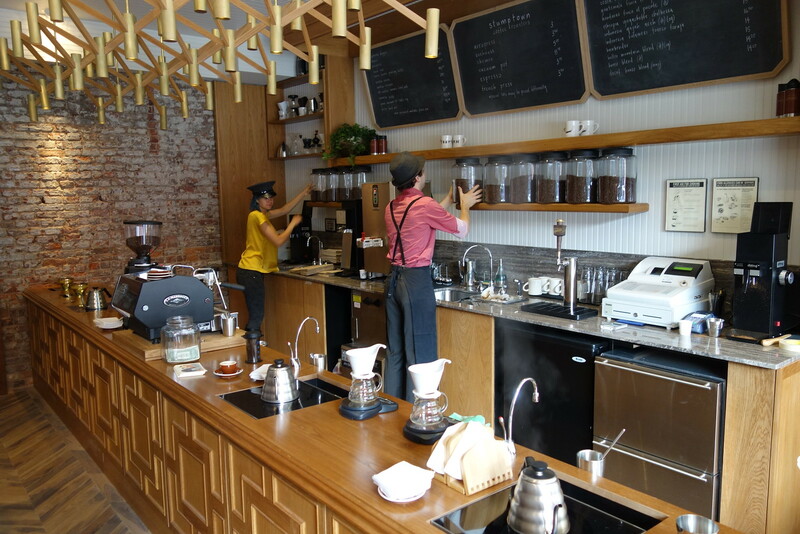 The delineation between the cafe and the Brew Bar prevents the slowness in service many other cafes offering single serving pourover coffee experience. 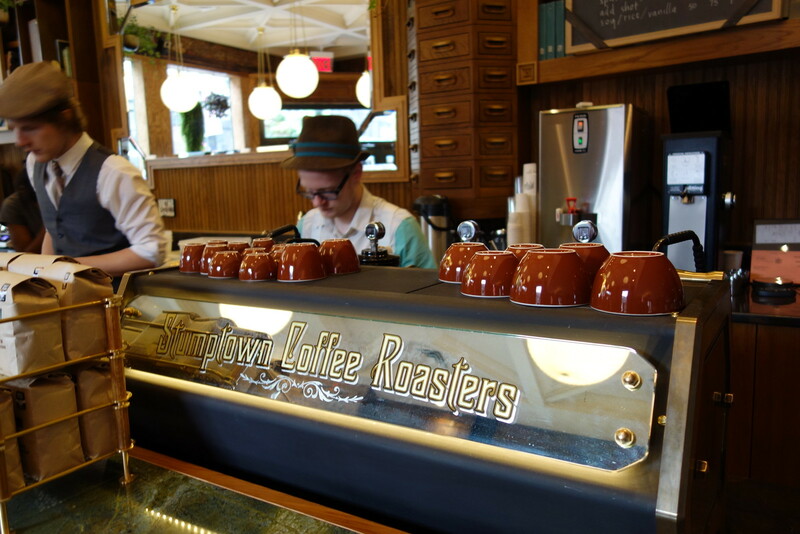 The shop is elaborately designed with the stylistic detail one has come to expect from Stumptown Coffee. 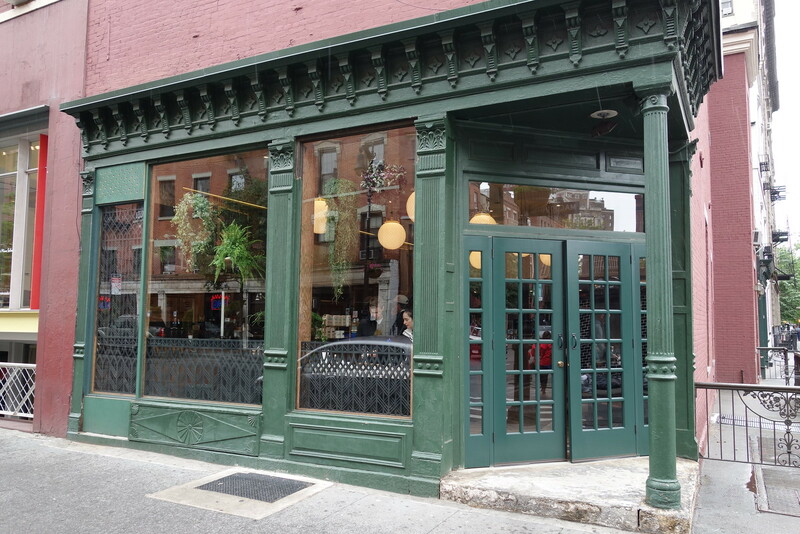 High ceilings, hanging plants, and tall windows create a light and airy feel often lacking in Manhattan cafes. The wood and tile work in conjunction with the antique books and artifacts lining the custom shelving create the experience of being in an old library or museum more than a cafe. Somehow the space still feels inviting and comfortable despite its somewhat over-designed aesthetic. The room is almost always crowded with laptop campers. We recommend making use of the sidewalk seating or taking your coffee to the park. The front cafe offers the standard range of Third Wave espresso drinks. While the lattes and other milk-based drinks are fine, the Hairbender espresso blend changes often and is as inconsistent as the baristas making it. Iced coffee is served both on tap as well as in stubbies and cartons. The pastry selection is a pretty standard array of baked goods from a number of local vendors including Momofuku Milk Bar cookies, croissants from Lafayette, Magpie pop tarts, and muffins and scones from Ovenly. Those interested in more careful coffee preparation should skip the lines and head directly to the brew bar, where single origin espressos are pulled (no milk drinks) on a single group La Marzocco GS3. In our experience, the shots here are also hit or miss but generally more worth the risk than the front cafe. The entire Stumptown Coffee menu of single origin coffees is available and can be prepared by the cup utilizing a number of brew methods. Although selecting a coffee and one of five possible pourover brew methods is daunting, the friendly baristas are quick to give enthusiastic recommendations. The Brew Bar preparation is a bit pricey and takes about five minutes but is worth it for those who enjoy their coffee black. There are free public cuppings daily at 2 pm that are a great resource for those wishing to learn more.